Radioimmunoassay (RIA) requires specialized equipments. It is required to take all precautions which required to handle radioactive material. Hence ELISA is substituted with RIA, In ELISA antigen antibody reactions are estimated by means of colorimetric endpoint indicators in place of a radioactive signal in RIA. In ELISA enzyme peroxidase reacts with substrate tetra 3’3,5’5 methylebenzidine resulting in change in colour as a indicator for presence of a antigens or antibody. 2.This radioactive labeled antigen is mixed with a known amount of antibody for that particular antigen,they form radiolabeled antigen (hot antigen) and antibody complex as a result of antigen antibody reaction. 3.Sample of serum (cold antigen) containing unknown quantity to be tested or quantified for a same antigen of that same antigen is added to radiolabeled antigen and antibody complex . 4.A further reaction occurs in between (hot antigen) and (cold antigen) antigen from patients serum, for binding previously added known amount of antibody , the reaction is a competitive between with the radiolabeled antigen and serum antigen for antibody binding sites. 5.As the concentration of serum antigen(cold antigen) increases, the concentration of (cold antigen) binding to the antibody goes on increasing, resulting in the displacement of radiolabeled (hot antigen), At the end point bound antigens are then separated away from the unbound ones, and the radioactivity of the these unbound antigen remaining in the supernatant is estimated. 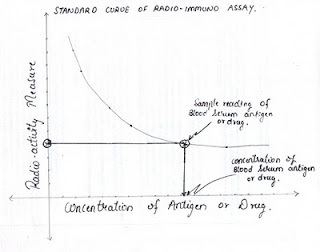 6.Using known standards, a standard binding curve is plotted from this curve the radioactivity measured can be extrapolated and the amount of antigen in the patient's serum to be obtained. A.More is the concentration of a antigen in patients serum less is the radioactivity measured in bound antigen reading. B. 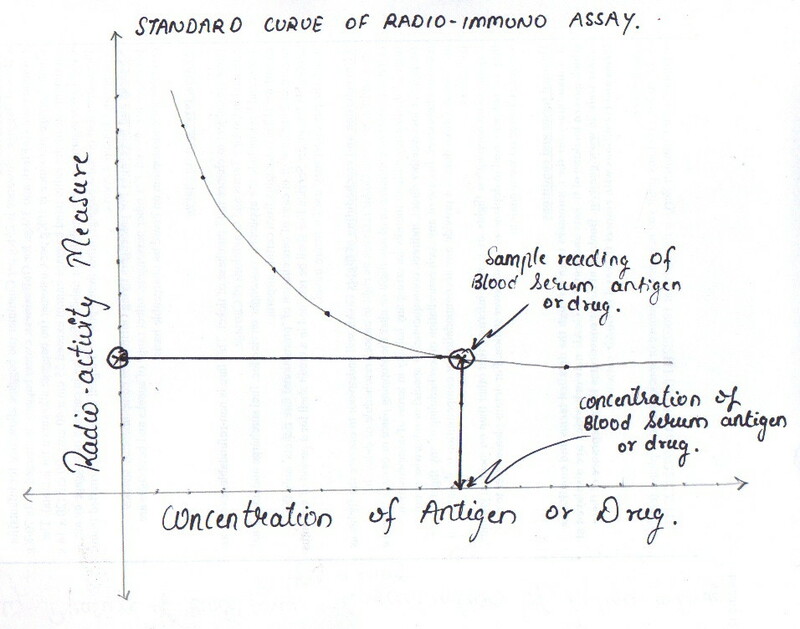 Less is the concentration of a antigen in patients serum more is the radioactivity measured in bound antigen reading. Radio immunoassay’s (RIA) are employed in pharmaceutical industry in research and development for estimation of concentration or quantification of blood level or bioavailability of a particular drug molecule where other methods interfere in quantification , this involves first development of an antigen for the drug to be estimated by using RIA. Radio immunoassay was developed by Rosalyn Yalow and Solomon Aaron Berson , they were awarded with noble prize for sucesfull development of the RIA for quantification of insulin. Labels: What is Radioimmunoassay (RIA) ?